Discover the Easiest Way to Manage Your Social Media! Social Champ is the best way to drive traffic, increase fan engagement and save time on social media. It saves your time by scheduling posts, analyzing performance, and suggesting content. Social Champ is the tool that I use the most for my social-media efforts. It’s the cleanest and most efficient tool that I’ve found. Social Champ has unique features that I love. One favorite is the ability to add images from the blog post that appear on Twitter without adding your own graphic. What a time saver and it helps my visual marketing shine online! Social Champ isn't just your usual scheduling tool - it has some fantastic features up its sleeves! It doesn't just satisfy your inner-geek, but really boosts your productivity and effectiveness for your social media marketing. without adding your own graphic. What a time saver and it helps my visual marketing shine online! Social Champ is an innovative solution that helps you publish your content in an intelligent way to maximize exposure. without adding your own graphic. What a time saver and it helps my visual marketing shine online! Social Champ is an effective tool to automate your social media posts. What I like best is auto-retweet feature that allows me to repeat my own tweet multiple times throughout the day based on the schedule I set in advance – it’s a time saver! without adding your own graphic. What a time saver and it helps my visual marketing shine online! I'm loving Social Champ and can not rave enough about it. Such an easy interface, makes repeating posts a breeze. It has the most brilliant features without over complicating things. One of my favorites is the 'suggested articles' - makes finding content and sharing content one simple click away. I'm recommending it to all my clients. The damn thing works. Unlike many others I have tried in the past. Having used all other platforms, Social Champ is my favorite. Easy to use. Easy to schedule. Hard to live without. 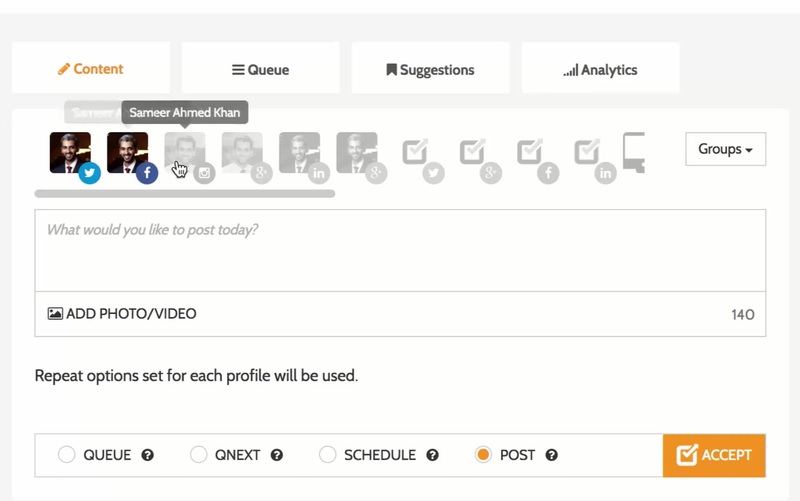 Add all your social media profiles and then post or schedule content on multiple profiles in a single click just from Social Champ. On twitter we give two creative options to repeat, either users can auto delete their previously posted tweet or, chose the option of auto-retweeting this previous tweet. We show grouped analytics that separates the clicks of each repeat too. Download CSV Template given in Social Champ, fill it up and upload to schedule 1000+ posts all at once, in a single click! You can also schedule a post for every 'Week', 'Month' or 'Year'. For example wishing birthdays, or monday motivation quotes, etc. Add all your favorite blogs to automate the posting on the respective social media as soon as a new blog post gets published. Social Champ let's you schedule your content easily on Facebook, Twitter, LinkedIn, Google+ & Pinterest, with a single click. Social Champ allows you to organize your posts way ahead of time, making it easier for you and your team to organize campaigns & scale your social media marketing efforts. We provide a CSV file template, all you have to do is fill it up & upload. Interesting stories to share on social media filtered by topics of your choice; cats, food, startups, we have them all! You can also add your favorite blog and schedule easily.